When we launched Google Shopper in February, I never expected that my 20% project would quickly become one of Google’s most popular Android applications. With over 2.5 million downloads in just 9 months, many Android users are using Shopper to help them shop on the go. Today, we’re excited to announce the next version of Shopper. In addition to existing, popular features like local availability, fast barcode scanning and voice search, version 1.3 includes new search filters like “price” and “brand” to help users refine their searches to find the perfect product. In addition, version 1.3 includes new “featured lists” - lists of products to help you shop during the holidays. When you have a spare moment, you can browse through suggested gifts and then click through to find the best place to buy them. To get Shopper, Android users can go to Android Market for the free download. If you’re an iPhone user, you can use Mobile Product Search (m.google.com/products from an iPhone or Android device) to get many of the same great features. Sorry, but the provided URL for iPhone - m.google.com/products - gives a 404 message. Looks great and it's super quick. I noticed though that I cannot share a found item via either Buzz or my Exchange email. Gmail is fine and there's a pretty long list of other options ... just those two seem to be missing now. 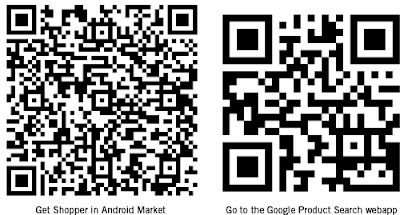 Same here, the second QR brings to http://m.google.com/products but the page doesn't exist. And WTH isn't the Shopper Android app available here in the French market? When will this be available for the UK? 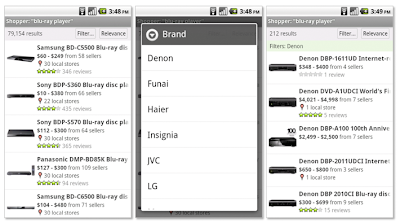 when shopper was first introduced, it was available on the android market outside the US. now it is not. why? there are those who live abroad who may be interested in products made in the US, and who would like to do some comparison shopping. please make shopper -- which is also a great demo app for android along with goggles -- available as a free app outside the US.